Exquisite Custom Built 3 Bedroom/3 ½ Bath Home plus DEN, OFFICE, BONUS RM, LOFT & POOL! 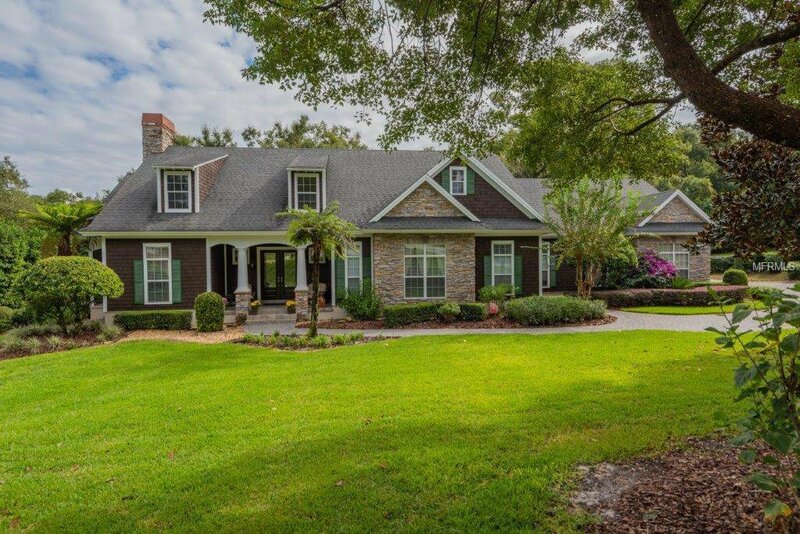 Located on a quiet 1 ACRE Private Lot, this home represents ultimate quality & detail in excellent condition offering Florida living at its finest. Stone accented covered Entrance w/double Mahogany Doors open to an Expansive 2 Story Foyer & Great Rm w/24 Ft. vaulted ceilings, wood beams, stone Fireplace & attached Den or Office. Lg Gourmet Kitchen w/Custom Cabinetry, Granite, 5-burner Gas Cook top flows into the Dinette w/French Doors to Lanai. Separate Dining Rm w/lighted tray ceiling. Private Office w/separate Entry Door to outside. Main floor Master Suite w/2 closets, dual vanities, granite, jetted tub & lg glass shower. Additional En-suite Bedroom on Main Floor. Upstairs Loft Area, 3rd Bedroom w/private Bath & Bonus “secret rm” w/ staircase to Garage. Gorgeous Covered Lanai w/Outdoor Kitchen; solar heated Pool w/3 waterfalls, extra screened porch on side of home, all overlooking the private park-like Back Yard. Massive 3-Car Garage(1000 ft) plus 2nd small Garage w/workshop that includes AC, commercial vac & 220 outlet w/Paver Driveway. Home finishes include: tile flooring, 8’ solid pine interior doors, custom trim work, crown molding, arches, custom draperies, plantation shutters,oversize closets & more; Recent updates include: 3 AC units replaced, exterior completely painted, trees trimmed, fans, fixtures & termite bond. This home is a DREAM & only minutes to DT Mount Dora & easy access to 429 to Orlando & Disney. Listing courtesy of REALTY EXECUTIVES SEMINOLE. Selling Office: FLORIDA REALTY INVESTMENTS.